Rationalist Judaism: Behold the Cave Bear! Last week, the Biblical Museum of Natural History received an astounding donation from Avraham and Rebecca Silverstein of Netanya - an extraordinary collection of taxidermy and other zoological artifacts. It filled some holes in our collection of Biblical animals - we finally have a leopard! And there are also some animals which, while not Biblical, help illustrate other Torah concepts, such as shofars and kashrus. Aside from the leopard, another important Biblical animal that was missing from our collection was a bear. Bears are mentioned on several occasions in Scripture, and lived wild in Israel until exactly one hundred years ago. But it's proven difficult to acquire a taxidermied bear for the museum. Last year we were offered a bear by one of our taxidermy suppliers, but he wanted 40,000 NIS for a specimen that was only four feet tall. I wasn't going to spend forty thousand shekels on Paddington Bear! But the Silverstein collection included a bear - sort of. The unquestionable highlight of the collection is the complete skeleton of an extinct cave bear! According to the information on this specimen, it was found over a hundred years ago in a limestone cave near Trieste, Italy. This skeleton, standing over seven feet tall, represents a unique specimen in that all of the bones belong to a single adult individual. Most fossil cave bear mounts on exhibit in European museums are composite skeletons from cave deposits which have preserved the remains of hundreds of bears over long periods of time; sorting for accurate anatomic assembly is virtually impossible. The cave where this specimen was found yielded only one specimen. Thus, the present specimen is a faithful anatomical example of this once great extinct species. 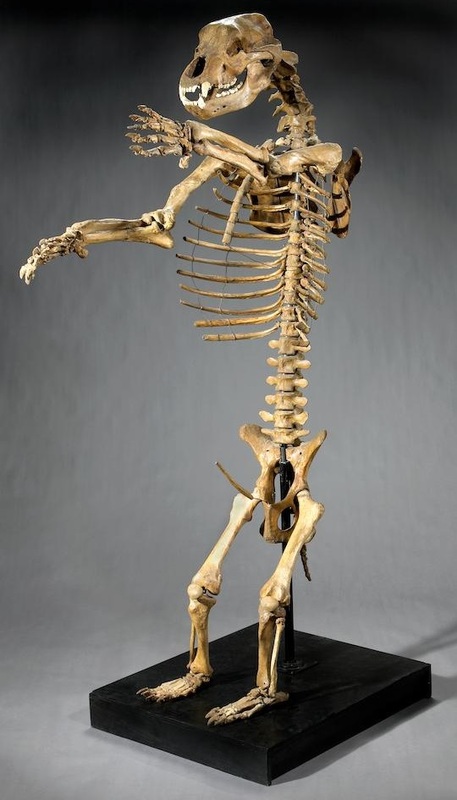 Possessing the distinction as the first fossil cave bear skeleton to be mounted in an upright position, the specimen is virtually complete and very well preserved. The paleontological record indicates that this species of cave bear (Ursus spelaeus) existed almost exclusively in Europe, from approximately 300,000 to 10,000 years ago. Depictions on cave walls by Ice Age humans, and examination of its skeletal structure, indicate that the species resembled a brown bear or grizzly bear at first glance. But Ursus spelaeus was much larger on average and displayed a more domed head and a higher forehead profile. The body had a relatively long neck on a barrel-shaped torso, with limbs rather short but very powerful as compared to those of the living brown bear. So, it's a spectacular and historically important specimen. And it fills an important Biblical niche in the museum. But the problem is that, as I have taken pains to make clear, the Biblical Museum of Natural History is intended for audiences across the religious spectrum. We don't display anything that would offend the sensitivities of the charedi community. No dinosaurs, no talk about evolution, no talk about the world being millions of years old. So what do we do with a bear that is approximately a hundred thousand years old? The answer is simple. As I instructed the guides, the only thing that they need to say about the cave bear is that it is extinct (like the re'em). If necessary, they can add that it died before the mabul. There's no need to say exactly how long ago it died! Ironically, as much as I have tried to keep prehistoric dinosaurs out of the museum, it's some of our most charedi visitors who have brought them up. I recall one of our Israeli chassidic visitors asking me why we don't display dinosaur skeletons. And last week, in a tour group of 60 chassidic children, when I asked them to identify a certain skull, one of them excitedly shouted out, "a dinosaur!" (it was actually a lion.) "Ho ho ho," I chortled, "A dinosaur?! We don't have any dinosaurs here!" So, this spectacular cave bear is just being presented as a Very Old Bear. As I tell our visitors who ask about dinosaurs, I try to stay away from controversial topics! To repeat a question I asked during my own tour of your museum, will you be doing anything to commemorate the hundredth anniversary of the Death of the Last Israeli Bear? Amazing! Can't wait to see it! Regarding dinosaurs, I would recommend to all the amazing dinosaur exhibits at the American Museum of Natural History in New York City. They were recently redone based on the best modern science thanks to a $35 million donation from David H. Koch. Larger or smaller donations to the Biblical Museum of Natural History are always accepted. The magnitude of Mr. Koch's gift gives you an idea of the costs involved in maintaining an world class museum and I urge all here to contribute to the Biblical Museum of Natural History whether you have $36 or $36 million. i would have assumed that the reason you don't display dinosaurs is because they have nothing to do with BIBLICAL natural history (not just because they are controversial), or am I mistaken? Yes, that's also a reason! Aren't dinosaurs mentioned in Bereishit (hatenininm hagedolim)? Isn't it controversial to claim that a species went extinct? It certainly goes against the views of the Rishonim, but nobody today knows that. Interesting. I saw some article in Mishpacha last week, and a photo was about some educator talking to little kids about what got dinosaurs angry, or something similar. The point, I suppose, is that you can't cover your eyes, block your ears and shout "I don't hear you, I don't hear you" forever. Sooner or later, you have to come out of your cave and deal with facts. No dinosaurs, no talk about evolution, no talk about the world being millions of years old. [...] Ironically, as much as I have tried to keep prehistoric dinosaurs out of the museum, it's some of our most charedi visitors who have brought them up. I recall one of our Israeli chassidic visitors asking me why we don't display dinosaur skeletons. Aderabba, if you are a Charedi, then dinosaurs obviously were created during Sheishes Yemei Bereishis and existed alongside Adam HaRishon. Only a Kofer like Slifkin who believes in the word accursed scientists over the word of Hashem would avoid showing us dinosaurs because *he* believes that it contradicts the P'shat of Maaseh Bereishis. Not true. It's only the Christian creationists who embrace dinosaurs living alongside Adam. Charedim prefer not to discuss them. That's why even R. Meiselman's 800 page tome on Torah and Science doesn't even mention them. I'll have to take your word for it because I don't have personal knowledge. Still, the more intellectual Charedim must have some position on it. My sixth cheder Rebbe explained that the magical waters of the mabul caused bones to grow. Therefore, what scientists risibly term "dinosaurs" were, in fact, salamanders! It seems the only dinosaur he knew was what was then called a brontosaurus. Is there a place on this blog where you explain the reasoning behind limiting the information about your exhibits in order to ensure accessibility across the religious spectrum? I'm naturally biased, especially as an educator of children, but I would be interested to hear the ethics behind it. 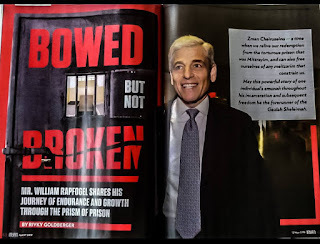 Were Chazal Able To Extract Science From Torah?